As retailers begin to offer E15 to consumers, this small crack in the blend wall will soon grow. With the first major retail players starting to offer consumers the choice of lower-cost E15 blended fuel, a much-anticipated domino effect appears already under way. And it looks to be a game changer. How much of a game changer? Moving to 15 percent ethanol is expected to lessen the country’s dependence on foreign oil imports to the tune of seven billion gallons annually. That’s significant when you consider the U.S. pumps around $300 billion each year into foreign countries for oil. Instead, the move to E15 will mean $24.4 billion injected into the U.S. economy. The move also has the potential to create about 136,000 new jobs, all while lowering prices at the pump and reducing the load on the environment caused by greenhouse gas (GHG) emissions. In fact, ethanol industry advocacy group, Growth Energy, estimates that as much as 8 million metric tons of GHG could be removed from the air each year. After a long and arduous process, the ethanol industry’s push to break through the blend wall – the artificial limit on the ethanol market – appears to be scoring a win, both for the industry and consumers. In January, Tennessee-based convenience store operator MAPCO Express, Inc. announced it would begin offering E15 at new sites as well as select existing MAPCO mega store locations. In making the announcement, Dan Gordon, who serves as Vice President of Business Development for MAPCO, pointed to the company’s culture of innovation, setting the stage for the arrival of E15 fuels. “Ethanol-based fuels have been a lower-per-gallon cost alternative over the past few years and this should allow us to offer our customers additional fuel options,” he added. If everything goes according to plan, MAPCO hopes to have 100 of its stores offering E15. “The MAPCO announcement clearly indicates retailers are starting to see the potential of E15 as a marketing tool that helps generate value for their business. Prior to MAPCO, additional momentum was building around Murphy and Minnoco both announcing they are offering E15,” says Mike O’Brien, Growth Energy’s Vice President of Market Development. In October, independent stations in the Twin Cities area announced their intent to cut ties with major oil companies and begin selling E15 fuel under the brand Minnoco, leading to aggressive pricing at 20 cents less than regular 87 octane. Minnoco’s goal is to add 100 stations to the brand within five years. Similar announcements of E15 availability have come from Murphy USA, which began offering E15 in Arkansas and has plans to expand availability throughout the Midwest, and American Freedom Energy, which became the first retailer to offer E15 in Ohio. In December, Growth Energy announced results of a retailer survey showing E15 was helping drive additional sales for retailers and there were no issues with the fuel. The battle to provide consumers with the option of E15 at the pump has been long-fought. For years, federal regulations mandated all fuel be at least 90 percent gasoline, despite two-thirds being derived from imported oil. The mandate put a stranglehold on advancements for ethanol and other biofuels. Ultimately, restricting ethanol to 10 percent of blended fuel flew in the face of the Renewable Fuels Standard (RFS2) enacted with the 2007 Energy Independence and Security Act. 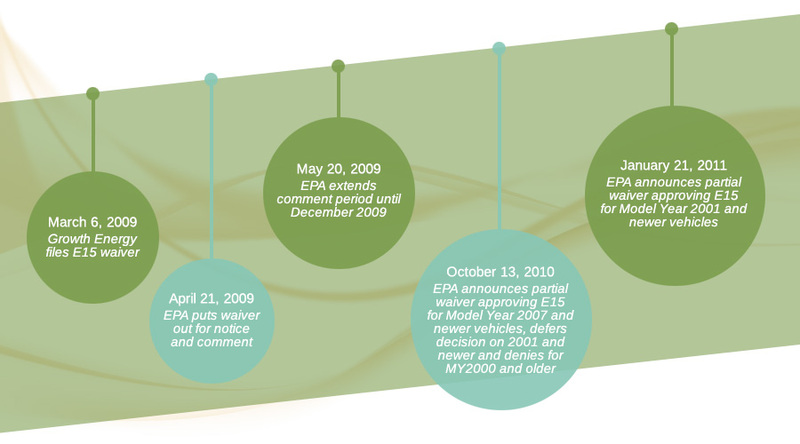 In March 2009, Growth Energy petitioned the U.S. Environmental Protection Agency in hopes of accelerating adoption of domestically produced renewable fuels. The action, which cited scientific evidence overwhelmingly supportive of E15 as a fuel, asked EPA to raise the “blend wall” to allow for a 15-percent blend of ethanol in the fuel supply. The long-anticipated answer finally came in January 2011 when the EPA gave the go-ahead on E15, officially raising the blend wall to E15. The next step was for major convenience stores to begin realizing the benefits of E15 and offering it. With commodity volumes expected to balloon worldwide, Broin says the move to E15 is extremely critical to the agriculture sector. If E15 didn’t come into play, plummeting prices would be devastating for rural economies. Broin says MAPCO’s announcement is a major step forward, not only because it puts E15 at 100 stores across a large geographical area that others will have to compete with, but because the announcement and press attention will force every major retailer to look more seriously at E15. There’s little doubt among ethanol advocates that the existing oil industry, which boasts a long tenure influencing fuel regulations, has held E15 back for the last several years, as ethanol supporters were forced to deal with one hurdle after another. The fact that MAPCO is also a refiner is noteworthy. “It sends a strong message to Washington that refiners are moving to E15, negating the argument by oil companies that E15 fuel is not being marketed in the U.S.,” Broin explains. But don’t expect oil companies to give up too soon. Broin says without question, those opposing ethanol will do everything in their power to twist the facts and scare consumers away from what is essentially a better product.